Your move, UFC. 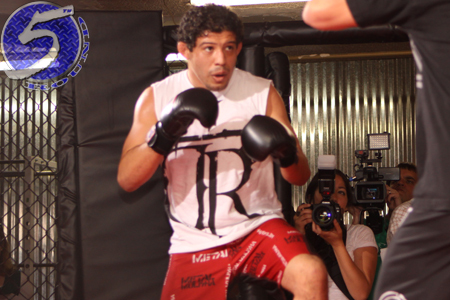 Former Strikeforce lightweight champion Gilbert Melendez (pictured), mixed martial arts’ hottest restricted free agent, has come to terms on a multi-year deal to join Bellator MMA. “The moment Gil was legally able to explore the free agent market, Gil’s management team reached out to me and we began figuring out how to bring Gil to Bellator,” Bellator CEO Bjorn Rebney expressed in a statement. “It’s no secret that I’ve been a big “El Nino” fan for many years. Gil was one of the first fighters I tried to sign when I launched Bellator back in 2008, and he’s grown and developed into one of the best and most exciting lightweights on earth. Gil has a vision for what he wants to accomplish both inside and outside the cage and we can help make his vision a reality. As customary with MMA deals, financial terms of the contract were not disclosed. Friday’s news comes on the heels of UFC president Dana White’s statement Thursday that he’s “done” trying to negotiate an extension with Melendez. White was frustrated he couldn’t seal the deal, so he allowed UFC co-owner Lorenzo Fertitta to take over the talks. It appears Fertitta couldn’t muster up the goods to retain Melendez in time. However, the UFC has the right to match Bellator’s offer. No word on when that deadline is. Melendez owns a 22-3 professional record. Prior to joining the UFC in April 2013, he was considered by most as the world’s best lightweight not competing inside the Octagon. If Fertitta and White decide to let Melendez bounce, they will help their biggest rival bolster their already-deep 155-pound division – spearheaded by reigning champion Eddie Alvarez and Michael Chandler.